Two small islands, each with only a few houses on them, appear to be floating over some mudflats at the Halligen Sea in Germany, not far from the Danish border. 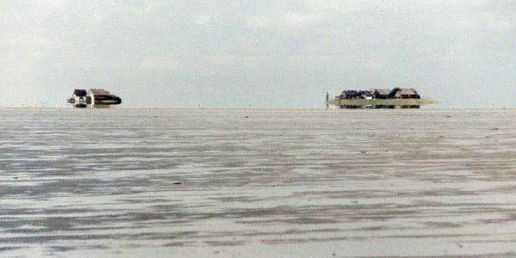 The picture is an example of an inferior mirage, by which the inverted images appear below the uplifted erect ones. Inferior mirages are caused by the refraction of light through layers of warm air close to the surface.